Just as a man’s home is his castle, of his life he is king. Or so goes the notion subscribed to by the ambitious young Irishman at the heart of the lyrical stories told by Colin Teevan’s three toiling labourers, chipping away at secrets and received certainties with the same sweaty vigour with which they hack at the rocks littered at their feet. With unobtrusive poetry that lilts to the swing of the spade, three men weave myth, dream, tragedy and defeat, drawing a direct line from the doomed heroes of Ancient Greece to the thwarted dreams of the tortured Irishman, the chancer who seemingly grasps at fate only to find himself clenched in destiny’s stony grip. The ironic kingdom of Teevan’s play is the abandoned Irish homeland, a country shrouded in both romance and fear. In a tale told through three generations, the other promised kingdom – that of heaven – is discarded in favour of a more earthly and all too ephemeral set of riches. But in place of the usual tale of the plucky young Irish lad seeking his fortune in England, Teevan presents us with narrative suffused with myth. The familiar echoes of Greek tragedy begin to overlay what opens as three stories but gradually emerges as just one, the trio of tales meeting with a creeping inevitability, like the crossroads at which the story’s crucial narrative hinge is located. As hinted at by the mound of rocks reaching to the ceiling of the Soho Theatre’s small upstairs space, there is much about the building of status, of a better life, of a future just out of reach. Anthony Delaney’s grinning young man greets opportunities with wide eyes, all youthful excitement with just a glimmer of greed, while his older counterpart Owen O’Neill holds on to what he has constructed with tight fists. These grasping figures are counterpointed by the next generation above, embodied in Gary Lilburn’s bowed, broken, but grimly wise old man. As all three men shapeshift, taking on different roles and picking up dropped narrative threads, distinct moments in time collide and merge. Past and future are always present. Often moving as heavily as the exhausted workers, Lucy Pitman-Wallace’s understated production can feel like a toil, particularly in the opening minutes. Between the labour there is a suffocating stillness, a stillness that respects the haunting movement of the narrative’s slow revelation and that evokes the thick black air of its gloomy tunnel setting, but that also threatens to let the piece turn stale. It’s a delicate line between contemplation and boredom. This stasis, broken only by the distracting movement of digging, lays all the burden on Teevan’s symbolism drenched script, a burden it fails to fully support. In contrast with the evidence of the earth that spreads around the three performers, the lyricism of the text embraces the suffering but not the grit. 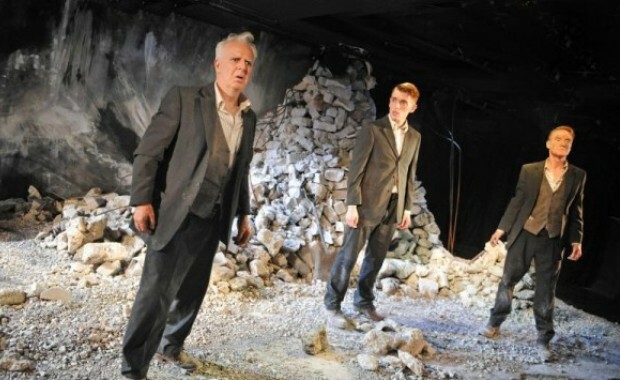 Failing to acknowledge the tension between the tragic fall from grace and the grinding of the working man back into the mud from which he dragged himself, the play’s bleakness is of the same romanticised kind that is frequently attached to “the kingdom” itself. We learn much of myths, but little of men.